Cheap Double Glazing - How to get the best double glazing prices? Cheap Double Glazing - How to get the best double glazing prices? What’s the cheapest double glazing? And how to find the best prices. Whether you are moving into a new house or looking to improve your existing one, an important aspect to take into consideration is, of course, the windows. These greatly influence the light and ventilation in rooms and so have a lot of impact on the overall atmosphere of the house. Not only that, but they also represent, alongside your external doors, one of the first lines of defence against the weather and, if not more importantly, potential intruders. Doubled glazed windows have proved many times over how much better they are than single glazed windows across all aspects of window performance, Because of this, they remain high on the list of the most popular, and financially prudent, home improvements that you can undertake. Fitting double glazing to the whole house can sometimes be expensive, but there are a number of things to think about in order to help you find good quality cheap double glazing without compromising too much. Why install new double glazed windows? Save on energy bills by losing less heat through the windows. Increased security from reinforced frames, internal beading and multi-point locks. Eliminate the “sun bleaching” of your curtains or furniture from Ultra-violet light. Eliminate condensation with built-in trickle ventilation. Reduce noise pollution – a 60% drop compared to single glazing. Improve the property appearance and add value at the same time. What are we going to look at in this guide? There are quite a number of different types of double glazing window designs in the market, therefore it’s important to take the time to review them and decide which one best suits your property beforehand. How does modern double glazing work? If you know what the key elements in your windows are, it will help you buy the right ones for your home. Choosing the material for the window frames. If you are looking for cheap double glazing, you need to know which is the most cost effective. The choices you make here can have a significant impact on pricing. So once again, if you are in the market for cheap double glazing, you need to know what is going to bump up the costs. How much do double glazed widows cost and which is the cheapest double glazing window in the market? This is where we get down to the important numbers. What are the most popular types of new or replacement upvc windows in the UK? The most popular design is likely to be a Casement window. This is probably the window that first comes to mind for most people. 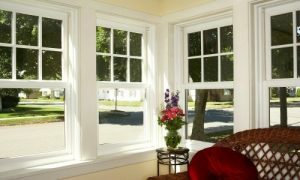 Most Casement windows are hinged to one side or the other of the frame and open outwards. Variations would be designs such as in Bay or Bow windows, Awning windows (hinged at the top), Hopper windows (hinged at the bottom) and French windows (a double set, side hinged, that open from the centre). Next to the Casement type, Sash windows, are slightly less popular for new installations, but remains a window style which can be seen all over the UK, especially in older period homes. There are 2 types of Sash window, vertical sliding and horizontal sliding. By far the most common design is the vertical sliding Sash. Sashes open by sliding up and down within a track set into the sides of the outer frame. The moving Sash is connected by ropes (that run over a hidden pulley wheel within the side frame) to a counterweight that is built into the outer frame. Typically, there will be an upper and lower Sash. If both open it is called “Double-hung”, if only the bottom Sash Opens, it is called “Single-hung”. A specialised casement window design is the tilt turn double glazed window, which opens inwards from side hinges. The special thing about this design is that the opening window can be configured to tilt inwards from the top instead of opening from the side. Therefore, the window has 2 functions, but they can’t both be used at the same time – it’s either tilted or turned. A variation on this has been introduced to allow Sash windows to tilt in much the same manner. Which is the cheapest double glazed window design? You will find that the cheapest design for double glazed windows will be the Casement window. Sash windows, especially timber box Sash windows are more expensive that Casement or Tilt & Turn. As a quick idea of the cost difference, for the same size of window. If the Casement design cost around £250, then the same size Sash window may cost £500, with tilt & turn at around £400. So double glazed casements are definitely the cheapest double glazed windows in this section. 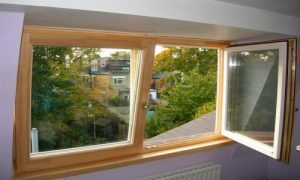 Bay or Bow windows, no matter if they utilise Sashes or Casements, can be costly because they are projection widows (project outwards form the property) and are made from a series of individual window segments (3, 5, 7 etc.) to make up the Bay or Bow. 2) How does modern double glazing work? The double glazing is created by having 2 panes of glass in the frame which are then sealed together to form a “double glazed unit”. The 2 panes are held apart by a spacer bar. Basically, it’s a glass sandwich with the spacer bar as the “filling”. The gap between the panes can be a partial vacuum or filled with a heavy gas such as Argon. Both the vacuum and the gas deter conduction and convection of heat or cold. This is how you can keep the inside of the window cool, even if the outside is hot and vice versa. The gap size can be varied from 6mm to 20mm. If you add the thickness of the glass (2x4mm) it gives a total double glazing thickness from 14mm to 28mm. It’s often said by those in the know that the optimum sized sealed unit is 16mm. The glass can also be modified to be solar reflective (metal oxide coated) which makes it an even better insulator. The window energy rating will also be a price factor. Replacment windows are rated from A++ to G, with C being the lowest accpetable rating to meet normal UK buiding regulations. A++ will cost more than C rated windows. The frames can be made from timber, aluminium or uPVC, all of which are durable materials, but timber needs the most maintenance, especially if it’s softwood. 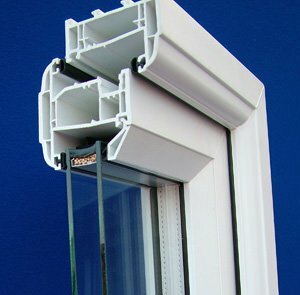 Aluminium and uPVC frames are chambered to make them more energy efficient. UPVC frames can have metal reinforcing to make them even stronger. Of these, which is the cheap double glazed window? In terms of materials, softwood windows are the cheapest. Hardwood and aluminium are the costliest and UPVC is in the middle somewhere. However, if you take into account the life-span of a badly looked after softwood window compared to the others (also badly looked after), you are going to need to replace softwood much quicker. This causes a deferred cost, and so in the longer term UPVC double glazed windows are the cheapest. A “C-rated” double glazed window with 4mm gap plain glazed units (with no gas) will be the cheapest double glazing. In terms of A++ ratings, 20mm gap, low-e metal oxide coated double glazed units, filled with Argon gas, will be the most expensive double glazing. 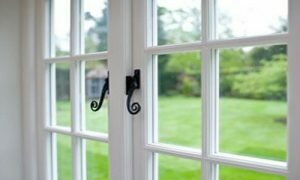 Of the 3 main types of material used most often in the manufacture of double glazed windows, Timber is the most flexible when it comes to colour of finish. You can paint or stain it any colour you like and you can decide to expose the grain or to cover it and have a gloss surface finish. Both uPVC and aluminium double glazing can be found in a range of different colours. 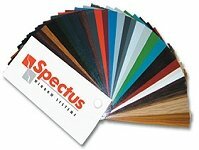 Aluminium powder coat surface paints have the biggest range with over 150 colours from which to choose. The coloured UPVC range is more modest at around 20 colours or so, which may sound like a disadvantage compared to aluminium, but actually 20 colours are more than sufficient to cover any situation or personal preference within reason. Both offer wood-grain effect surface finishes. Which is the cheapest double glazed window colour? White is the cheapest double glazed window colour. No matter which material you choose to have the window manufactured from, white is the colour that comes as standard. All UPVC and aluminium colours (other than white) can attract an extra charge, as can wood-grain effect surface finishes. There are any number of choices to personalise the appearance of the glass within the windows. You can go for leaded glass with a diamond or square pattern (there are more options), or you could have a special design in coloured glass. Obscure and / or frosted glazing can be used for visual effect or to create a degree of privacy, maybe in your bathroom windows for example. Which is the cheapest glass design? No prizes for guessing that plain clear glazing is the cheapest option. Leaded glazing will be at an extra cost, so will coloured or patterned glass. 4) Cheap Double Glazing – how much does it cost? Cheap double glazing is not necessarily easy to come by, so before getting a quote it’s best to decide clearly what sort of windows you are looking for, as we covered above. Think about which of the above types best suits the wall and space that you are fitting them to. Also, look at other houses in your area to make sure that you get a type that fits in with your area and doesn’t make your home “stick out like a sore thumb”. One step in getting cheap double glazing that not everybody has the time for, is to visit trade shows or consumer home exhibitions. By visiting an exhibition, you can see for yourself what’s on offer in terms of the types of windows you were thinking about. If possible and practical, you could even visit a company’s showroom before inviting them to your house, so that you can get a feel for the company before entering into business with them. Also, talk to friends & relatives of theirs who have had dealings with the company beforehand. Now that you have a good idea of what you want and a few possible companies, the golden rule in looking for cheap double glazed windows is to not rush into anything. It would seem that, taking all of the above into consideration, if you want cheap double glazing the best choice is to go for white UPVC windows with 16mm sealed units. This choice is likely to give you optimal appearance, thermal performance and lifespan, therefore offering the best potential value for money. We believe you should get at least three or four different quotes and don’t let any one company pressure you into signing a contract straight away. 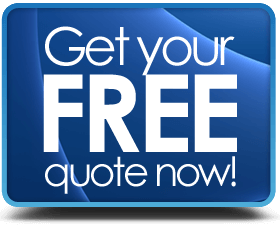 Make sure the quotes are for exactly the same materials and products, and also compare the price for any extras. How much you can save is hard to say as it depends on the details of what you are buying, but by knowing exactly what you want and making sure you take time to compare companies and their quotes, you can give yourself the opportunity to get the cheapest double glazing on offer. A final, important, thing to take into consideration as you look for cheap double glazing, is that alongside the big national window installers, there are also many local installers. Make sure that at least half of your quotes are from some of these local companies. They can often offer very competitive deals, as well as having the advantage of offering a local, personal service and the possibility of asking to see some of their work in the local area. In any case, take care that whoever installs your windows is registered with FENSA or CERTASS, as this ensures that they offer a high level of service and comply with current regulations.